Yes. You can complete an in-bank withdrawal (also called a teller cash withdrawal) with your RushCard. You may withdraw up to $3,000 per calendar month. Note: There is a $3.00 over-the-counter withdrawal fee for this transaction. How can I apply for a RushCard? You can apply online by clicking here or visiting www.rushcard.com. Will I get approved if I have bad or no credit? Can I apply for a RushCard if I am not a U.S. Citizen? How long will it take for my RushCard to arrive? You should receive your card within 5-7 business days. You can track the status of your RushCard here. How old must I be to apply for a RushCard? The minimum age requirement to apply for a Prepaid Visa RushCard is 13. Parental consent is required for anyone under age 18. Click here to download a parental consent form. Can I have my RushCard mailed to a P.O. Box? Yes, but to do so we must also have a physical address within the U.S. Call our toll-free number 866-RUSHCARD (866-787-4227) for a customer service rep to assist you. We cannot send Expedited Cards to a P.O. Box. Do I select "checking" or "saving" when I withdraw my RushCard funds from an ATM? Select "checking" and enter the amount of cash you want to withdraw. Why search for an ATM? Use your RushCard wherever you shop and get some quick cash back instead. Watch how easy in-store cash back can be. You can always call 866-RUSHCARD (866-787-4227), 24 hours a day, 7 days a week for further assistance. You will need to set your PIN to activate your card. What is the fee for withdrawing funds from an ATM? You may withdraw money at no cost if you use any of the thousands of in-network ATMs coast to coast. Click here for the ATM locator. If you use an ATM outside the network, you will be charged $3.00 per transaction, plus any additional charge assessed by the ATM owner/operator. Can I check my balance at the ATM? If you use an ATM to check your balance, you will be charged $0.50, plus any additional fee assessed by the ATM owner/operator. If there is an error with my ATM withdrawal, how can I get that corrected? To report and dispute an ATM transaction that you never made, contact RushCard at 866-RUSHCARD (866-787-4227) 24 hours a day, 7 days a week for a Customer Service Agent to assist you. Please note that ATM charges are not covered under the Visa Zero Liability7 policy because the PIN number you selected is used. Remember: you should NEVER share your PIN with anyone or write it down on your card, or keep it with your card. If the ATM did not dispense funds or dispensed the incorrect amount, we will research this error. Contact RushCard at 866-RUSHCARD (866-787-4227) 24 hours a day, 7 days a week, to request an Error Allegation form. Where can I use my RushCard? Your RushCard may be used for purchases and payments anywhere Visa debit cards are accepted - in person, online, or over the phone. See Cardholder Agreement for complete details. Your RushCard CANNOT be used for gambling purposes (e.g, online gambling websites). Do I select "credit" or "debit" when making purchases? You may make purchases with your RushCard using either method. Please refer to the paragraph labeled "Your Liability for Unauthorized Transfers" in the Cardholder Agreement for a description of the rights and protections applicable to Visa debit and non-Visa debit transactions. If I make a purchase, when are funds taken from my account? The merchant will authorize your RushCard at the time of purchase and the amount will be deducted from your available balance. However, some merchants, such as gas stations, restaurants, auto rentals and online merchants, may place a hold on your RushCard for the estimated amount of purchase or more. See Cardholder Agreement for complete details. I see "Pending Transaction" in my account history. What does that mean? Whenever you use your RushCard for a purchase, there is a process used to verify that you have enough funds on your card. When you make the purchase, a "hold" is placed on your card (It shows up as a "Pending Transaction" on your card account transaction history online or on your RushCard mobile app (standard text message and data rates, fees, and charges may apply)). Money that is "on hold" cannot be spent. Once the merchant receives confirmation that the funds are available, a "settlement" is posted to your card account and the funds for that transaction are withdrawn. In many cases, it takes several days for a settlement to come through, and the hold will remain in place until then. You cannot dispute a transaction until a settlement has been posted to your card account. Yes, but keep in mind that some auto rental agencies do not accept debit and/or prepaid cards. If you use your Card for a car rental purchase, or for similar purchases like at restaurants or hotels, the merchant may preauthorize the transaction amount for the purchase amount plus up to 20% or more to ensure there are sufficient funds available to cover tips or incidental expenses incurred. Any preauthorization amount will place a "hold" on your available funds until the merchant sends us the final payment amount of your purchase. Once the final payment amount is received, the preauthorization amount on hold will be removed. All transactions relating to car rentals may result in a hold for that amount of funds for up to thirty-five (35) days. During the hold period, you will not have access to the preauthorized amount. 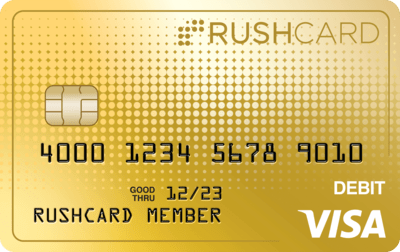 Can I buy gas with my Prepaid Visa RushCard? Yes. However, if you use your Card at an automated fuel dispenser ("pay at the pump"), the merchant may preauthorize the transaction amount (place a hold) on your Account of up to $125.00 or more. This may cause your Card to be declined even though you have sufficient funds in your Card Account to pay for the transaction. If this happens, pay for your purchase inside and tell the cashier exactly how much you want to spend. Is there a limit to how much money I can spend? Yes. See the Cardholder Agreement for complete details regarding spending limits. If I return something I purchased, when will the credit show up on my card? Credits/returns usually post within 3-5 business days. What do I do if I'm unhappy with a product or service that I purchased with my RushCard? If you are disputing the quality of a product or service provided, you should contact the merchant directly with your concerns. If there is an error with my purchase, can I dispute the transaction? Did you purchase the service or product, but not receive it? Or did you receive it and are unhappy with its quality or safety? If so, the situation can often be resolved by contacting the merchant directly. Explain the situation to the merchant, and they may credit your RushCard for the disputed amount. Did you not purchase the service or product? If so, please immediately contact RushCard at (866) RUSHCARD (866-787-4227), available 24 hours a day, 7 days a week, to notify them that you did not authorize the transaction. Please refer to your cardholder agreement for more details. How long does a dispute usually take to complete? Disputed transactions can take up to 90 days to resolve. We may ask that you complete an Unauthorized Transaction form. This form will help us conduct the dispute investigation. Please refer to your cardholder agreement for more details. How can I check the status of a dispute I filed? Please allow a minimum of 60 days for the issue to be resolved. If you do not see a credit on your card account after that period of time, contact us at 866-RUSHCARD (866-787-4227) 24 hours a day, 7 days a week, and a Customer Service Agent will assist you. How do I download the RushCard mobile app? No, there is no charge for the iPhone or Android App. However, while this feature is available for free, certain other transaction fees and costs, terms, and conditions are associated with the use of this Card. See Cardholder Agreement for more details. Strict policies and procedures are in place to ensure that your card account information is kept confidential. Only authorized signers can access card account information. Don't share your PIN with anyone. If you do, you may be providing others with unwanted access to the funds on your RushCard.- Memorize the PIN; don't carry it in a wallet or write it on the card. If the terminal appears to be modified or suspicious, do not enter your PIN. If your RushCard is lost or stolen, contact us immediately at 866-RUSHCARD (866-787-4227)) 24 hours a day, 7 days a week, and a Customer Service Agent will assist you. If you are not preparing your tax returns yourself, remember that you are sharing very sensitive information with your tax preparer. Be sure to choose a reputable individual or company. How do I set up my online card account and password? You can set up your online card account in the RushCard mobile app (standard text message and data rates, fees, and charges may apply) or at account.rushcard.com. You will be asked to choose a login ID and password to protect your card account information. You will also be asked to provide security questions that will verify your identity if you ever need to reset your login ID or password. Why do I have to choose/answer security questions during the registration process? This is for security purposes, to better protect you and your money. If you ever need to reset your login ID or password, your security questions can be used to verify your identity. How do I pay bills with my RushCard? Watch our Pay Bills video to learn more. What types of bills can I pay using Rush BillPay? You can pay almost any business or individual that you currently pay by check: your phone bill, loan payments, insurance - even your dentist or daycare center. *Please note you CANNOT pay court-ordered payments or state and federal taxes with Rush BillPay. What steps do I take if my RushCard is expiring? You will receive a renewal RushCard in the mail 2-3 weeks before your card expires. When you receive your renewal card, call the number on the sticker on the front of the card to activate it. You can also open the RushCard mobile app (standard text message and data rates, fees, and charges may apply) and select "Activate Card" option or visit account.rushcard.com and select "Activate Your Card" to activate your card. Once you activate your renewal card, your old card will no longer work. Please cut up and dispose of your old card. The balance on your old card will automatically be transferred to your new card. How do I get started with RushGoals? Log in to your online account and select "RushGoals" from the "RushCard Rewards" menu. RushGoals allows you to create goal accounts to put money aside for special purchases, and then to track your progress. How do I add and withdraw funds from my RushGoals account? You can add or withdraw funds online to your RushGoals account by transferring funds to and from your RushCard. Does my RushGoals account earn interest? No. RushGoals is not a savings account and you will not earn interest on the balance9. A RushCard cardholder can receive $30 for each friend they refer who sets their PIN and loads their Prepaid Visa RushCard via ACH credit, cash load, or Ingo check deposit. The referred friend will receive $30 too! In order for both parties to receive $30, the referred friend must apply with the cardholder's unique referral code, set the PIN for his/her new Prepaid Visa RushCard and fund their account. At a minimum, you must add $50.14 A cardholder's referral code can be found by logging into account.rushcard.com and selecting Refer-a-Friend from the "RushCard Rewards" menu. Watch our Refer-a-Friend video to learn more. Yes. A Referring Member may receive up to 20 Refer-a-Friend bounties per calendar year while the program is available. How do I login to my RushCard account? You can login to your RushCard account via the RushCard mobile app (standard text message and data rates, fees, and charges may apply) by using your fingerprint (also known as biometric) to sign in. You can also enter your login password if your fingerprint login is not set up. Or, you can login at account.rushcard.com with your login ID and password. The maximum withdraw from an ATM in one transaction is $500.00. The maximum cumulative amount that may be withdrawn from multiple ATMs is $3,000.00 per calendar month. Fees may apply. Please see the Cardholder Agreement for more details.